PLEASE NOTE: This review is out of date and does not reflect accurate comparisons with its sister product, the BenQ HT2550, which has undergone improvements since its introduction. AN UPDATED REVIEW OF THE BENQ TK800 CAN BE FOUND HERE. Brightness Uniformity. Our TK800 sample measured a very good 82% uniformity, better than the 73% we saw on the HT2250 test unit. Since this is essentially the same light engine with a different color wheel, we suspect the difference may be due to manufacturing variance. 3D Performance. 3D Performance. The fact that the TK800 offers 3D sets it apart from the Viewsonic and Vivitek units as well as the Optoma UHD50 and UHD60. The only other 4K (or 4K-enabled) projectors under $2000 to offer 3D at the moment are the Epson Home Cinema 4000 at $1799, which is 4K compatible using pixel shift on 1080p 3LCD panels, and the Optoma UHD51A at $1699. 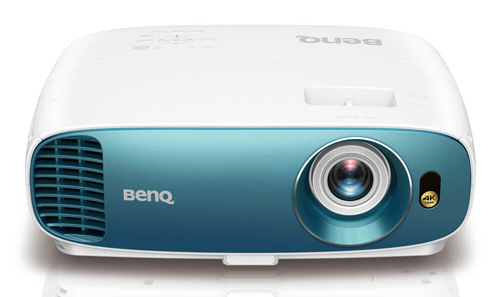 Our sample of the BenQ TK800 performs noticeably better than did our sample of the BenQ HT2550. The TK800 focuses sharply from edge to edge across the screen, brightness uniformity is up to 82% from 73% on the HT2550, and color balance in factory default calibrations is (oddly enough) a bit closer to neutral than was the HT2550 although it is still on the cool side. It is a brighter projector and its increased brightness does not overly compromise color saturation to any significant degree. Overall, we are more enthused with the TK800 than we were the HT2550 based on these two samples. However, the HT2550 we reviewed was one of the first production units off the line. BenQ has done a firmware upgrade to that model since our review. Since our test unit of the HT2550 was returned after the review, we have not seen the latest HT2550 with the new firmware. Based on the improved performance of the TK800 we think the HT2550 is worth a second look. It is quite possible that there have been some QC tweaks in manufacturing that account for the improved image sharpness and brightness uniformity of the TK800 over the early edition of the HT2550. If that is the case the HT2550s being shipped today may look better than the one we tested. 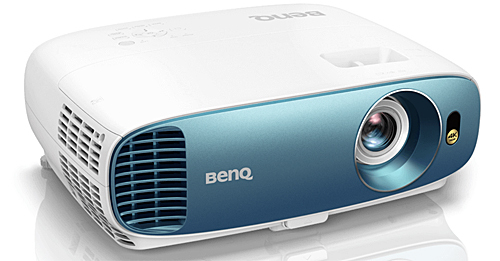 From a value perspective, the BenQ TK800 combines 4K resolution with a bright picture, very good uniformity, 3D capability, and a three year warranty for $1499. Vivid TV mode in particular gives it extra vibrance for ambient light viewing. If that combination of features for that price hits your hot button, we believe you'll have a lot of fun with the TK800. Will you be reviewing the W2000+ at some point? It seems to be BenQ's top 1080p model for price/quality now and I am curious to see it evaluated by experts!